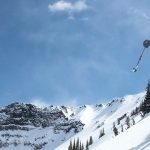 The Black Diamond Mission is avery well built and designed ski shell that performs well inbounds resort skiing and in the backcountry. A Gore-Tex shell with a more supple face fabric and thicker backer, the Mission should last a few seasons. The relatively sleek design leaves little to break. Testers liked the beefy front zipper, which should last longer than more delicate smaller-gauge zippers. Like the other shells here, its got a long hemline, tall collar, big hood, and long sleeves for if you lift your arms above your torso. It’s also got waterproof zippers on the pit zips, a powder skirt, and excellent tabs on the cuffs and multiple adjustment point on the hood. It’s easy to batten down the hatches on this jacket. The Gore-Tex membrane breathed on par with others we tested. The pit zips are enormous (18-inches long), so it vents extremely well. The Mission checks in with seven pockets, including the invaluable twin internal drop pockets for quickly stashing items like gloves and hat while messing around on a lift or for shedding heat while walking uphill. It features nifty cohesive imbedded cord locks on the hem, which are stylish, but also less likely to be plucked off. The Mission is cut generously for a less constrictive fit for dynamic riding and to be able to layer up underneath. BD put the powder skirt lower than on most ski shells in order to improve breathability—it stays below the hand pockets, so there are fewer layers of fabric overlapping at the waist. It’s also relatively lightweight, so is at home in the backcountry as in the front-country.